To meet in Krabi, a livable town with lovely residents, and to remember when depart, is what Krabi Cinta means. 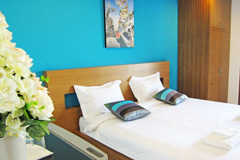 Single and double beds, full facilities, TV, refridgerator, hot shower and Wi-Fi. Single-bed room, 22 sq. m. Double-bed room 24 sq. m.
• A transfer from and to Krabi International Airport and Krabi Pier is provided for THB300-500. • Taxi, tuk-tuk, and mini-bus to and from Ao Nang Beach take 15-20 minutes, fare: THB50-300. • Hotel taxi is available, please contact front desk. 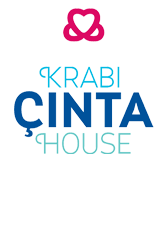 © Krabi Cinta House All Rights Reserved.